Asuka is a talented woman who works hard at her real estate job, but her true dream is to get married and be a loving housewife. She seems to be on the fast track to realizing that dream... until her boyfriend of five years suddenly asks to break up. She meets Nanami Ryuu, a young hotshot TV announcer, who is accomplished, handsome, and acts the perfect gentleman, but he is strongly opposed to marriage. Is it possible to get along without agreeing on such an important issue? 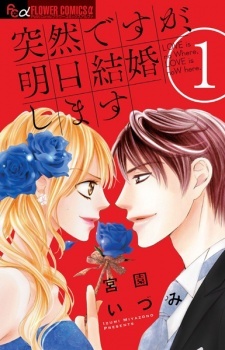 Totsuzen desu ga, Ashita Kekkon Shimasu has been published in English as Everyone's Getting Married by VIZ Media under the Shojo Beat imprint since June 7, 2016. I'm surprised to see that this manga has no reviews since it's one of my favorites. The story in a nut shell is about a hard working girl who really wants to get married to become a housewife. Strange-I know. It got me at first but it turns out the main girl is a hard worker, does her job nearly flawless and is well respected. It is weird how she wants to drop everything to be a stay at home, but she believes it is her only way to be in a happy family since her own family is the same. She's at the normal marrying age and has a long term boyfriend. Right when she thinks her boyfriend was finally going to propose...he breaks up with her. Later she meets a mysterious man: he is handsome, very well liked, a famous reporter-he seems so perfect until he tells her he never plans on getting married. The art is very nice. The side characters of both triangles annoyed me so that's why I rate it a 9/10 but besides that the central romance is cute. The main couple is very attractive and the character development between the two on the idea of marriage collides. Please take your time to read it. It's a nice story. It's probably a bad sign when, in a romance story, the most enjoyable parts are when the couple are at work and not when they are actually interacting with one another. The amount of tension they are able to build as Nanami navigates working as a telecaster is actually quite well done (the mangaka clearly did their research for the series and is putting it to good use), but when it comes to the romance of the story its pretty much stereotypes shot right through (old girlfriend, mistaken understandings of situations, "I just can't help it" attractions, etc.). I really wanted to enjoy this series because I felt it had a novel characterization lined up for Asuka as she is a go-getter business woman who actually wants to get married, quit her job, and be a housemaker. I felt like the dynamics of being a professional and wanting to get married would give an interesting setting for the story, but it's mostly just been dropped in the conversation as an afterthought it feels. The real problem, however, is that I cannot for the life of me discern any reason why the main couple are together - they jump from just getting to know each other and having a basic respect for each other's personality to suddenly "being in love" and dating, and then while dating they literally never see each other (I'm not just saying this - its literally what they are dealing with for several chapters - and also what gives all the good material with them at work). As things progress, you start to seem some more thoughtful reflection by the characters as the main plot line takes on a little more depth, but its done so gingerly and in such small spurts its hard to believe that there is really much substance to the characters. In the end, this is a drop.